Created in 2000, Serving Venice, Laurel and Nokomis residents, located behind Legacy Trail. 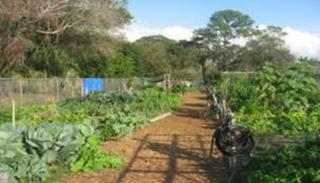 The garden consists of 2 rows of 8 plots each with water faucets in front of each plot. Entry to the garden is from Forest Street. The garden is located on the edge of Laurel Park with picnic and athletic fields available. For bikers, access to the Legacy Trail is easy and convenient at the back of the garden.